If you are a writer, and you work hard, are stubbornly persistent, and submit what you write to markets that publish the kind of thing you write, eventually you will start selling what you write1. And if you sell what you write, you will inevitably come into contact with editors. Indeed, it is possible to work with editors before making your first sale. Before I sold my first story to InterGalactic Medicine Show back in 2007, I went back and forth on revisions with the editor there until he felt the story was good enough to publish. I write all of my stories using Scrivener. In fact, as I’ve ventured out into other areas–like essays, books reviews and interviews–I find that it is just as easy to write those using Scrivener as it is fiction. And so it makes sense that in working with an editor, I’d want to do as much of that work in Scrivener as possible. The problem, of course is that Scrivener produces a manuscript in some standard format–often a Microsoft Word document. This document is submitted to the market in question, and if a sale is made, and revisions are required, it has been my experience that these revisions are often done using the Track Changes feature in Microsoft Word. In other words–outside of Scrivener. Here, then, is how I go about weaving Scrivener into the editorial process. I’ll break this down into phases so you can get an idea of what the full life-cycle is like for me, and how I use Scrivener throughout. And because I have recently made a sale in which I worked with the editor quite a bit on revisions, I’ll even supply some real-world example. I generally write my stories in two drafts. The first draft of the story is often like a sketch of what the story will become. It is where I try to fit all of the moving parts together without worrying too much about the language. I have all different manner of ways of doing this. It really just depends on the story. But I always start by creating a new project in Scrivener using my SFWA2 Short Story template. This template has several elements that allow me to track the life-cycle of the story, which is important to me because I often learn a lot from the evolution of the story. As I said, the work log is just a text file that sits inside my Scrivener project. I usually update it at the end of each day if I’ve done some work on the project. Sometimes I will include, inside square brackets, the name of the snapshot that I am referring to in the notes. First draft: the rough draft of the story. Second draft: a better, fully integrated draft. This is what I tend to send out to fellow-writers for comments. Submissions draft: the draft that I submit to the market. It usually incorporates comments from #3. Publication draft: the version of the story that gets published. Sometimes I have more. In the case of the current project, I had four drafts as listed above, although sometimes I give the snapshots slightly different names. The editor sent me back a Word document with the Track Changes feature turned on. The document had a number of small changes that he suggested, plus several comments. Here is how I handled those changes to be sure they were incorporated into Scrivener. I repeat this for all of the editors comments in the Word document. Once I have all of the comments, I create a new Snapshot in Scrivener. This allows me to capture the comments in the version of the Scrivener document before I’ve made any of the editors suggested changes. This helps maintain the context of the comments, which might not make sense after the changes have been made. Next, I return to the Word document. I work my way through all of the suggested changes, accepting or rejecting them, and tweaking things as I go along. Once I’ve finished making changes to the Word document, I copy each scene into its corresponding place in the Scrivener project, replacing the text that was there. It’s safe to do this because I have the previous version preserved in a snapshot. This doesn’t take very long. There were twelve scenes in the story in question and so it meant twelve quick copy-paste actions. Finally, I send the Word document back to the editor for his further approval. Here you can see that I picked two snapshots, my first draft and the publication draft. In comparing them, I can easily see what changed: red strikeouts for what was removed and blue underlines for what was added. The text in black stayed the same. Keep in mind since this is comparing first draft to publication draft, not all of the changes are suggestions by the editor. Some of them were my own as I moved from an early rough draft to something more readable. Eventually, the story works for everyone involved and the editor sends you a contract. A copy of the contract goes into Evernote, but I also keep a copy of the contract with the Scrivener project so that I have everything in one place. I will also create a new snapshot at this point and called it the “Publication Draft – Market Name.” This represents the version of the document that will be published in the market to which I’ve sold it. That might seem like the end but it often is not. Many markets where I sell stories provide pre-publication “galleys” to the author. These are version of the story as it will look in print. The idea is that you can read through these one more time to look for typos that editors and copy-editors might have missed. Typically you mark these up and send them back to the editor with minor corrections. In cases where minor corrections are made, I’ll create a new snapshot called “Post-Galley Draft.” This, then, becomes the version that is published. And even that is not necessarily the end of things. If you are lucky, the story may be picked up for a reprint of some kind. In these cases, it goes through an editorial process all over again, and I’ll have snapshots for reprints, resulting in a “Publication Draft – Reprint Market Name” snapshot that represents the version of the story that gets reprinted. There are new contracts that I’ll add to the Scrivener project. And if it turns out that there are good reviews of the story out there, I’ll usually clip those and add them to a “Reviews” folder in my project as well. This may sound like a lot of work, but Scrivener makes it easy to do. And the truth is, it is well worth the effort, for me anyway. I can go back to a Scrivener project and watch the entire history of it unfold. I can look at the first draft, and compare it to a published draft. I can see what comments an editor made and what kind of feedback I received from beta-readers. I can look at my work log file and see what I accomplished on any given day. You’d be surprised just how much you can learn about the craft of writing from all of this information. Thanks, as a new-comer to Scrivener (already a complete convert) and long time aspiring but near-miss (so far) writer, I found this very helpful indeed. Thank you so much for posting this. So far, I’ve been using Scrivener for first drafts only, switching to Word after that because my editor and betas use its Track Changes and it seemed easier to just switch, but I think I’ll explore the snapshots feature with my next project… It does sound like a really useful thing. Thanks again! Thanks for this, Jamie! I’m using Scrivener for the first time and had been wondering about its uses post-first-draft. This article is a real help, especially regarding snapshots. I am writing academic research papers not novels. Yet I found your article very insightful, specially the smart use of snapshot. Very nice writeup. Scrivener continues to impress me more and more. Now if we can only get Scrivener to be friendlier with embedding images in the text. But then again, that’s not Scrivener’s role so much as it is a place to create and compare good text. 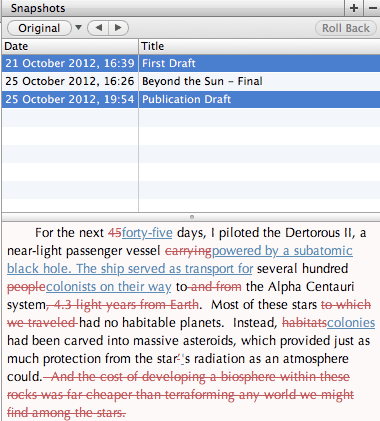 Not sure what I’m missing, but is the new version of scrivener maintaing all comments and edits when I copy? I just copy and pasted an entire word doc over to Scrivener and all my comments/edits came with it.